Let's Make Sure We Get It Right. The canary cage is more than just a place to keep your bird...it's your canary's home. Just as you need room to breath and move and stretch...so does your canary. One of the things that is important to your canary's well-being is his cage. There are three things in particular that you need to keep in mind. "room to breath and move and stretch". Make sure you get a cage that is right for a canary and not for other pet birds...Different birds have different needs regarding their cage. There are a lot of canary cages out there that are all wrong...usually they're the wrong shape and size. Click here to learn more about the correct size and shape of the cage. When you get your bird cage home, always do a quick visual inspection. More than one canary has lost a limb due to poorly constructed cages. Check out this war story about a canary that lost her leg and learn more about inspecting your bird cage. Always make sure the spot where you place your bird's cage is in a good location. Certain areas of your home could be death traps for your canary and others could just be downright uncomfortable. Windows, for example, can be terrible whether it is a hot day or a cool day. Cool drafts can give your canary a chill which can result in a lowered immune system. Humans have all kinds of terrible chemicals and other items in the home that can be deadly for your canary. 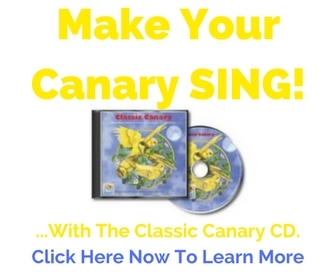 Click here, PLEASE!, to discover the ins and outs of canary cage placement. Just like any other pet, a canary requires certain accessories that will make his life more comfortable. First of all he needs good safe food dishes and waterers. Using a dish that absorbs moisture will promote bacteria growth and bacteria causes all kinds of health problems...use dishes made of the right materials. Your canary cage will also need a couple of good perches. Pay attention to style, size, and materials to keep your canary's feet healthy. Canaries can even get BORED so help keeping him entertained with a toy of some kind will be beneficial. Read more about furnishings for the cage...click here. Breeding canaries need a special cage...one large enough to house a breeding pair and several young chicks. Click here to check out the "Honeymoon suite"-->Breeding cage. Canary Illness? Singing Female or Egg-Bound Male? Another Canary In A Separate Cage Works Fantastic! !